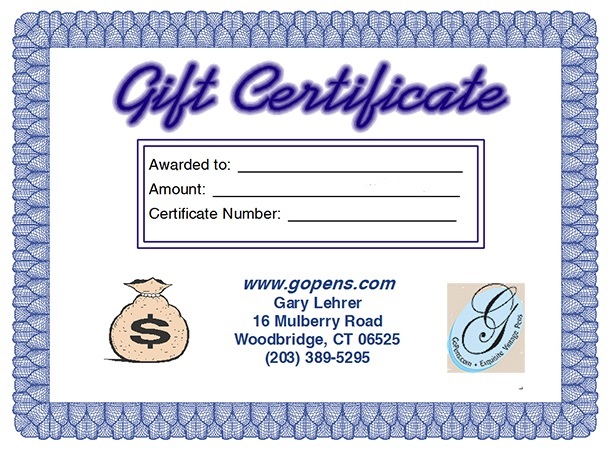 Did you know we also offer gift certificates? If you can’t figure out what that special someone in your life might like from our Catalogs, provide them with a gift certificate! Perfect for birthdays, anniversaries, special occasions, and just about anything else. Available in any dollar amount, just indicate the dollar amount and recipient’s name in the “Comments” section of your purchase. This entry was posted in Vintage Pens and tagged Fountain Pens, Go Pens, GoPens, Services, Vintage Fountain Pen, Vintage Fountain Pens, Vintage Pen, Vintage Pens. Bookmark the permalink. Follow any comments here with the RSS feed for this post. Post a comment or leave a trackback: Trackback URL.